Emmanuel celebrates '100 Years of Adaptation'. Published 3/29/2019. Local. 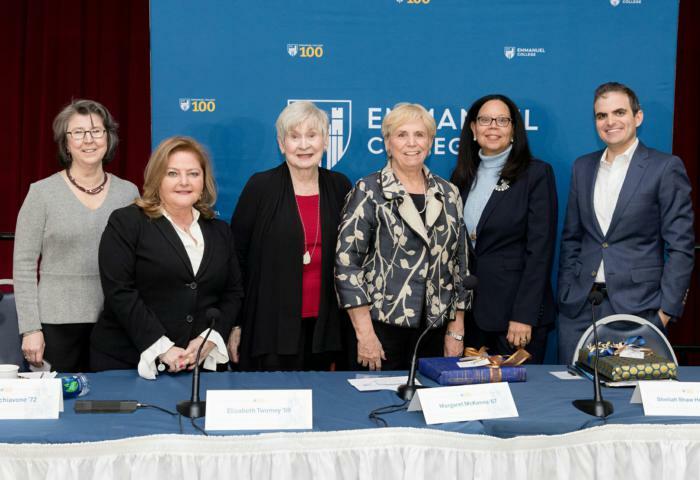 On March 13, more than 200 alumni, faculty, staff, neighbors, and friends of Emmanuel College gathered for a special centennial celebration, "Ever Changing, Ever Emmanuel: 100 Years of Adaptation." An alumni panel discussion on the college's ability to adapt and thrive during pivotal periods of change locally, nationally, and globally kicked-off the event and was followed by the unveiling of a museum-quality, decade-by-decade history of the college on the walls of the second floor of the college's administration building. In remarks preceding the panel discussion, Emmanuel College president Sister Janet Eisner, SNDdeN, said, "It is with profound joy that we come together today to launch Emmanuel's centennial, a historic opportunity to honor the pioneering spirit of the college's founders, reflect on our rich history, and celebrate the beginning of our second century." Moderated by contributing anchor for National Public Radio and senior lecturer at Johns Hopkins University Carey Business School Louise Schiavone '72, the panel discussion featured alumni from across the decades: Elizabeth "Betty" Twomey '59, former commissioner of education for the State of New Hampshire; Margaret McKenna '67, former White House deputy counsel and president emerita of Lesley University; Sheilah Shaw Horton '81, vice president and dean of students at Wellesley College; and Christopher Borges '10, scientist at Editas Medicine. Schiavone reflected on how Emmanuel has shaped the course of her life, her career and her values, beginning when she and classmates arrived on campus as "blank canvases." "Through friendships and marriages and children and losses, work and achievements, we have lived the canvas since that first September day, when we had no idea how it would all end: who would we be? Would we -- could we -- change the world? 'Yes, you can,' our school told us. 'You can, and you must.'" During the discussion, Schiavone asked panelists to share insights into the happenings on campus, in Boston, and in the world in their respective decades as students, and to reflect on how they have seen the college adapt to change for the future. McKenna, who was a student at Emmanuel during a time of great social change, shared that she and her classmates were involved in protests both on and off campus. "It was such an era of change, and we were right in the middle," McKenna said. "One of the things I admire most about this place is how I learned to stand up for myself and for others." During her distinguished career as an attorney and academic leader, McKenna has been a champion of civil rights, social justice, philanthropy and the advancement of women in leadership, and said she carried the values instilled in her at Emmanuel throughout her career, especially during her 22-year tenure as president of Lesley University. Borges, who attended Emmanuel as one of the earlier co-educational classes, remarked that Emmanuel has consistently adapted its programs and resources to accommodate the needs of students, referencing the recent construction of the New Residence Hall and the opening of the Maureen Murphy Wilkens Science Center in 2009 to enhance booming science programs. "In my time there was a need to expand the sciences beyond what we had in Marian Hall, so they built a science building -- but not just any science building -- the best science building, with cutting-edge equipment and all of the resources used at neighboring medical institutions," Borges said. "Emmanuel's ability to pivot and change with the times is not by accident," added Horton, who while at the college in the 70s and 80s worked to build stronger resources for students of color and to celebrate diversity across the community. She has since served in numerous leadership roles in higher education over the course of her more than 30-year career. "It's really because there's been leadership that has paid attention to the data, analysis and trends, and strived to make changes so the institution would be ready for the next level." 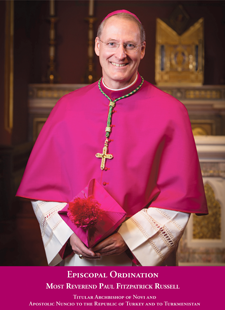 Rounding out the discussion, Twomey, who has had a distinguished career in the field of education, commended the college's ability to both adapt with the times and to retain its original vision and values. "While the college itself has grown physically, it also has done so academically; it has had the vision to look forward and see what was needed, and implemented it. So that, yes we are in tune with the times, but we're still us," Twomey said. "I think that is a very profound thing that has been accomplished all these years." Recognized during the event was Emmanuel's first fourth-generation student, Hannah Lynch '19, along with her mother Mary Goodhue Lynch '87. Lynch's grandmother, Elizabeth Healy Goodhue, was a member of the Class of 1953, and her great grandmother, Margaret Higgins Healy, was part of the first graduating class of 1923. The event was part of the annual Louise Doherty Wyant '63 Lecture Series, which focuses on humanities, history and the arts and is in honor of Sister Anne Cyril Delaney, SNDdeN. Wyant Professor Kathy Soles, whose mother Ruth McGovern graduated in 1946, offered welcome and concluding remarks.